The Sustainable Seafood Week with the message "Eat in Style–Know the Origin" opened in Ho Chi Minh City on August 14 in support of responsible production and products. During the 10-day period, besides introducing Vietnam's responsibly farmed seafood to the domestic market, the programme will engage consumers in exciting activities to raise awareness of sustainable seafood, through a display of informative artworks, a theme-inspired flash mob and exciting mini-games at Crescent Mall in HCM City's District 7. Consumers can visit cabenvung.vn to find the full list of restaurants participating in the programme, and also pledge their support online to demand sustainable seafood in the country. "Consumers hold the power of demand and they can play an important role in transforming markets and industries to become more sustainable," said Dr. Van Ngoc Thinh, Country Director for WWF (World Wide Fund for Nature) -Vietnam, organiser of the event. "When they speak and buy together, it encourages the community of farmers and producers in Vietnam that there is a domestic market, and they should continue developing sustainable seafood," he added. The Aquaculture Stewardship Council (ASC) and Marine Stewardship Council (MSC) stamps are two of the most widely recognised international eco-labels that confirm that seafood meets strict standards. Recent projects supported by WWF have greatly aided producers in the Mekong Delta to get their products certified. The number of the Mekong Delta's ASC-certified farms saw an almost nine-fold increase, from five farms in 2012 to 43 in 2014. Vietnam's consumers, however, barely know of the existence and availability of these products, since most ASC and MSC certified seafood in the country is exported and very little is available domestically. The Sustainable Seafood Week 2015 is part of WWF's effort to raise consumer awareness about the seafood sector's responsible practices. WWF looks forward to gathering key players of Vietnam's seafood supply chain – from producers to end users – in a joint mission to achieve the large-scale availability of internationally certified products in the domestic market in the near future, and thus improve the country's environment and consumer health. 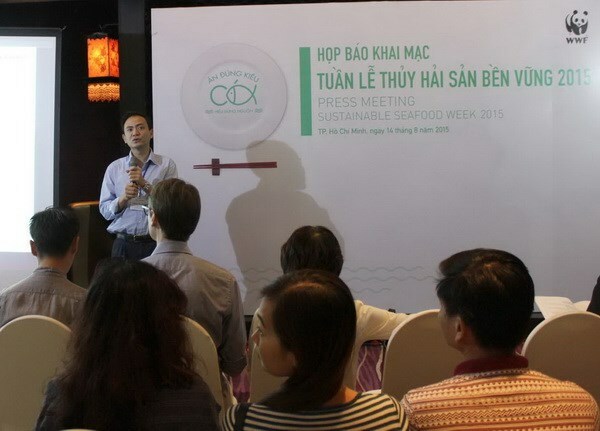 "Sustainability might be on every company's agenda, but when consumers don't see the benefits of your responsibly-produced goods in comparison to regular ones, it's easy to question the return on investment," said Duong Ngoc Minh, General Director of Hung Vuong Corporation, a top seafood producer in Vietnam, and the supplier of ASC certified seafood during the Sustainable Seafood Week 2015. In 2014, Vietnam exported 7.9 billion USD of seafood, an increase of 18 times compared with 2013. The Mekong Delta produces 80 percent of national seafood production, although it covers only 12 percent of the land of the entire country.